Donald Trump clearly hates Amazon. But he really should love it. 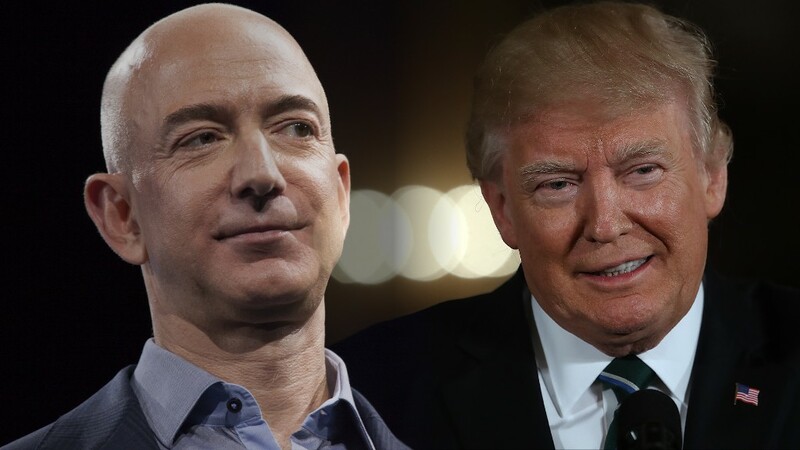 Amazon played a major role in two of Trump's biggest accomplishments -- the stock market rally and the white hot US jobs market. Consider this: The collective market value of S&P 500 companies grew by $2.8 trillion since Trump was sworn into office, according to Bespoke Investment Group. Amazon's market value alone grew by $340 billion since Trump's inauguration. That means that about 12% of the "Trump rally" can be attributed to his least favorite company. Amazon (AMZN) has also likely added more jobs than any other single US employer over the past year -- it hired about 225,000 people in 2017. Part of that is because it bought Whole Foods, which had 89,000 employees just after Amazon closed on the deal. Not all of the 136,000 other jobs added at Amazon were in the United States, but a majority of them likely were. The overall US economy added 2.2 million jobs last year, so Amazon is responsible for about 5% of that hiring boom. Trump's latest assault on Amazon blamed the company for forcing other retailers out of business. Last year was a record year for store closings, and there was about a 30% increase in retail bankruptcies, according to BankruptcyData.com. But those stores had plenty of competitive problems that went far beyond the growth of Amazon, including big box stores like Walmart (WMT). — Correction: An earlier version of this story gave incorrect figures for the change in S&P 500 market value and Amazon market value since President Trump's inauguration.